You may recall being shocked at Canadian photojournalist Paul Watson’s Pulitzer-Prize-winning photo of a dead American soldier dragged through the streets of Mogadishu in 1993 – equally shocked at the brutality and the publication of so graphic an image. Or you may recall the controversy surrounding the 2001 war documentary “Black Hawk Down,” which chronicled the ordeal that precipitated the desecration of the body of William David Cleveland, the dead soldier in the infamous photo. Most likely, you know little more about Watson, the man behind the camera, and the “voice” that haunted him the rest of his life. “If you do this, I will own you forever,” Watson “heard” Cleveland say as he took the photo. Playwright Dan O’Brien, himself plagued by “ghosts,” intrigued by Watson’s story, pursued him through emails and phone calls, attempting to befriend Watson and probe his psyche. O’Brien’s multi-award-winning play “The Body of an American” is less about the infamous photo than about Watson and what became of him, as well as O’Brien’s own introspection, a 90-minute dialogue between O’Brien himself, portrayed by Michael Crane, and Tony-Award nominee Michael Cumpsty as Watson. There is virtually no set, barring two chairs and a split-panel backdrop that serves as a screen on which images are projected, the split screen distorting the images – unfortunately. Richard Hoover’s sparse setting works, as it focuses all attention on Crane and Cumpsty and their interaction, the emptiness of their lives, their regrets and desperation. Their constant rearranging of the chairs moves an otherwise static scene, and brings a bit of much-needed comic relief in an Arctic scene, in which the chairs become dogsleds. 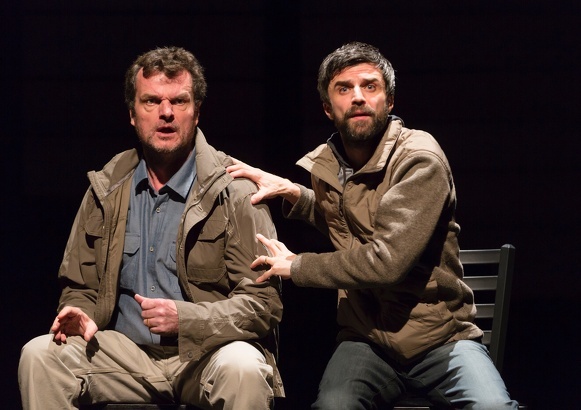 Crane and Cumpsty are masterful in voicing their at-times confusing dialogue and monologues, as they exchange characters, one becoming the other (outside himself), or adopt other roles – passengers on a plane, Watson’s translator and guide, even Mother Teresa. Crane is alternately timid and persistent as the driving force in this relationship/friendship. Cumpsty portrays a despondent, disillusioned Watson. Focused as it is on the men themselves and the phantoms that haunt them, O’Brien’s work simply probes the underbelly of human motivation, memory and guilt, leaving the audience to draw its own conclusions.